The Golden Girls has always been one of my favorite TV shows, and I have watched it almost everyday for longer than I can remember. It’s the only show that I can watch over and over and over and still laugh at the jokes and scrapes they get into like it’s my first time watching. Next week, Betty White, the last remaining Golden Girl (and Hot In Cleveland‘s version of Sophia), turns 90 years old. In honor of her approaching birthday, I thought it would be fun to do a list of trivia. Estelle Getty (who played the octogenarian of the group) was actually over a year younger than Bea Arthur who played her daughter on the show and she was the second youngest out of all four actresses. Reportedly, it took 45 minutes in makeup for her to transform into Sophia Petrillo. In several of the flashback episodes in which she portrayed a much younger Sophia, Estelle is shown without the wig and makeup. Rue McClanahan was originally set to play the part of naive farm girl Rose Nylund, while Betty White was to play the part of man-hungry, nymphomaniac Blanche Devereaux. However, both actresses felt that the characters were too similar to previous ones they’d played (Sue Ann Nivens on The Mary Tyler Moore Show for Betty and Vivian on Maude for Rue). Incidentally, both actresses had worked together before on the show Mama’s Family (Rue played the spinster aunt, Fran Crowley, and Betty played Ms. Harper’s pretentious daughter, Ellen Harper-Jackson). 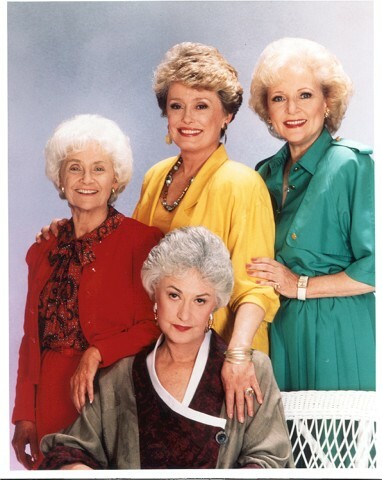 Rue McClanahan and Bea Arthur had also previously worked together on the aforementioned show, Maude. Harold Gould appeared as two characters on The Golden Girls. Rose’s college professor boyfriend Miles Webber and another boyfriend from the first season episode, “Rose the Prude” named Arnie Peterson. If you include his real identity, Nicholas Carbonne, and his second witness protection identity of Samuel Plankmaker, then you could say he appeared as four characters. He, along with Betty White and Nancy Walker (who played Sophia’s sister, Angela), was also on The Mary Tyler Moore Show. In the episode “Wham, Bam, Thank you Mammy”, Blanche is called by her full (maiden) name Blanche Marie Hollingsworth. However, in a later episode she says her full married name is Blanche Elizabeth Devereaux. Although it’s usually believed that Blanche’s real age was never revealed, in the season three episode, “Mother’s Day”, viewers learned that she was 17 years old in 1949, making her 53 at the beginning of the show and 60 when it ended. Bea Arthur originally wanted to leave the series after season five, but she was talked into staying on for an additional two seasons. In the opening credits, a shot of Blanche wearing a red jacket drawing her hand inside the sleeve is shown. This scene is never shown in the show. It was cut from the season one episode “Break-In”. Even though cheesecake was featured in around a hundred episodes, Bea Arthur hated the dessert. In the season two episode “Big Daddy’s Little Lady” as Rose begins to tell a story Blanche interjects with, “Must we take yet another trip to Petticoat Junction?” Betty White appeared in an episode of Petticoat Junction in 1969. Betty White appeared as Rose Nylund on four different shows: The Golden Girls, The Golden Palace, Nurses, and Empty Nest. Estelle Getty appeared as Sophia on six shows: The Golden Girls, The Golden Palace, Empty Nest, Nurses, Blossom, and Ladies Man. It was Rue McClanahan’s idea to give Blanche a Southern accent. Even though it was never mentioned on the show, Sophia’s maiden name was Grisanti. One of the TV stage managers for the show, Kent Zbornak, shared the same last name with Dorothy and her ex-husband Stanley. Next post: Is it spring already?